Today Judge Shelleyanne W.L. Chang ruled that 73rd Assembly candidate Anna Byrson made a false and misleading statement in her campaign statement. The judge ruled that the statement “On the school board, I returned $59 million to taxpayers” was false and misleading and ordered the statement stricken and re-written. In this type of ballot challenge the burden of proof the person challenging the statement is “clear and convincing” not the easier to prove “preponderance of evidence” standard. The petitioner, Mission Viejo resident Dale Tyler, via his attorney Chad Morgan, was successful in submitting clear and convincing evidence that Ms. Bryson’s statement was both false and misleading to voters. Ms. Bryson, as part of her opposition, submitted a declaration by her fellow CUSD Trustee John Alpay wherein he stated (among other things) that Ms. Bryson was “instrumental” in returning $59 million to taxpayers. Yet the Court still found the statement false and misleading! I represented Greg Powers in his challenge to Mr. Alpay’s ballot statement when he challenged former Trustee Mike Winston in the recall election of 2010. The Court at that time struck two statements contained in Mr. Alpay’s ballot statement as being false and misleading. So it is no surprise to me that Judge Chang found Mr. Alpay’s declaration in support of Ms. Bryson to not be convincing either. Full disclosure: I am supporting 73rd Assembly candidate Bill Brough (who currently serves on the Dana Point City Council). I was a supporter of Ms. Bryson in the past, but not any longer due to her voting record: Why to the Teachers Unions Love Anna Bryson? Check out Bill’s web site at Bill Brough for Assembly. 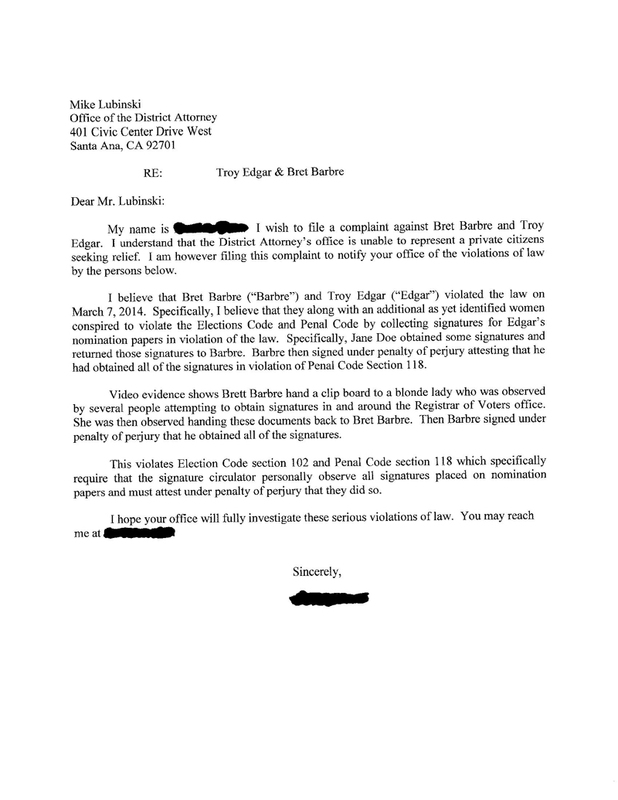 Petitioner Troy Edgar’s Petition For Writ of Mandate is denied in its entirety on the basis that Petitioner failed to meet his burden to show that Respondent Kelley’s actions of (i) refusing to qualify Petitioner as a candidate for the office of Clerk-Recorder; and (ii) qualifying Real Party In Interest Al Mijares as a candidate for the 06/03/14 election was in violation of the Elections Code or the Constitution. The evidence shows that Petitioner did not have the signatures of at least 20 registered voters who signed his nomination papers in his possession by the 5:00 p.m. March 7, 2014 deadline imposed by Elections Code § 8020(b). According to Respondent’s evidence, it is the practice of the Registrar of Voters to lock the doors to the office at 5:00 p.m. on the deadline filing date, “but to continue to process completed nomination documents for the individuals who are waiting in line at the time the doors are locked.” (Kelley Decl. ¶ 3) This practice is in compliance with Section 8020 since it limits processing to those candidates who presumably have met the requirements of delivering the mandated forms to the office by 5:00 p.m., i.e., the forms have been completed and are physically in the office by that time. As to the Declaration of Candidacy form, the Registrar’s stated practice of holding onto these forms until the nomination papers are received and verified comports with Election Code § 8028(a) which (with one exception) prohibits a candidate from removing this form from the Registrar’s office. Significantly, there is nothing in the statute or in case law that prohibits the Registrar’s office from considering the Declaration of Candidacy “delivered” as of the time a customized form is generated even though that form has not been signed off under oath by the candidate. Here, the evidence establishes that Petitioner did not have his nomination papers completed and in the Registrar’s office by 5:00 p.m. Elections Code § 8062(a)(3) requires that at least 20 registered voters sign nomination papers such as those at issue here. The provisions of Election Code § 8062(b) are mandatory, not discretionary, and no nomination paper shall be deemed sufficient that does not comply with this section. As it is undisputed that several of Petitioner’s 20 registered voters did not sign the nomination papers by the 5:00 pm deadline, Respondent did not have discretion to take any act other than to disqualify Petitioner as candidate for Clerk-Recorder. Petitioner contends that his late delivery of nomination papers should be excused given that he was in the Registrar’s office shortly after 4:00 p.m., and that due to the last-minute rush he was forced to wait until about 4:45 p.m. to obtain the required forms to be filled out. The implication that the Registrar’s office is to blame for his missing the deadline fails to take into account Petitioner’s decision to submit his paperwork at the absolute last hour of a 25-day period. (See Election Code § 8020(b)) Having previously run for election in Orange County (Edgar Decl. ¶ 7), Petitioner knew about the 5:00 p.m. deadline, but assumed he could complete the process in less than an hour. Obviously, he failed to take into account the possibility of many other candidates also showing up at the last minute. Given the express statutory mandate, the doctrine of substantial compliance is not applicable here, and Petitioner fails to cite any authorities that have allowed the use of the doctrine in circumstances similar to those at bar. Indeed, in the case most similar to the situation at hand, a court of appeal held that a lower court acted improperly in granting a writ directing a registrar of voters to accept a ballot argument submitted five hours past the statutory deadline. Barnes v. Wong (1995) 33 Cal. App. 4th 390. As stated by Barnes: “The doctrine of substantial compliance does not apply. Cases specifically dealing with statutory deadlines for election filings that are couched in language requiring documents to be filed ‘not less’ than or ‘not later’ than a given number of days before a designated time have insisted on strict compliance with the deadlines.” Id. at 396. More to the point, the problem with a substantial compliance argument as it applies to time deadlines is that it chips away at a rule designed to level the playing field for all candidates. Without a hard and fast deadline, the possibility of inconsistent (and potentially unfair) administration of preelection procedures is greatly increased. Likewise, Petitioner’s claims based upon Constitutional equal protection arguments are without merit, as Petitioner failed to present any evidence that the Respondent certified the candidacy of any other candidate that lacked the required number of registered voter signatures by the 5:00 pm deadline. Thus, he cannot show that he received unequal treatment by Respondent. Evidence presented by Respondent tends to show that any candidate who did not have the required number of signatures by the deadline would be treated exactly the same as Petitioner. As to Real Party in Interest Mijares, the fact that the clerk did not administer the oath required in connection with his Declaration of Candidacy until after 5:00 p.m. on March 7 does not change the result. Mijares testified that he delivered all required nomination papers as well as a signed Declaration of Candidacy well before 5:00 p.m. (Mijares Decl. ¶ 9) Indeed, his statement that he “delivered” the Declaration on February 20 is consistent with the procedure described in the Kelley Supplemental Declaration, as is the fact that it is signed under oath only after the nomination papers have been delivered and verified by the Registrar’s staff. (Kelley Supp. Decl. ¶ 9-10; Mijares Decl. ¶ 13-15) Administering the oath, which is done by the Registrar, is considered part of the processing of election papers that Respondent apparently routinely did after the deadline. Petitioner also failed to present any evidence whatsoever that issuance of the requested writ will not substantially interfere with the conduct of the upcoming election. Evidence presented by Respondent tends to show that the requested relief substantially interferes with the election. In short, Petitioner’s application for writ of mandate is denied in its entirety, and the Alterative Writ issued Court orders clerk to e-mail these minutes to all counsel and to give written notice. I was just informed that the judge has made the ruling that Troy Edgar will not be ops part of the Orange County Clerk-Recorder race. I suppose he could run as a write in candidate, but if his consultants couldn’t even get him on the ballot it is highly unlikely that he will pursue this any further. At this time we are awaiting more information as to what the judge’s opinion said. After the recent redesign the Orange County Superior Court website is terrible and very hard to navigate. As more information becomes available we will post it. 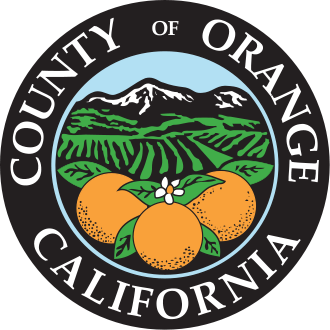 ORANGE COUNTY, CA – The Republican Party of Orange County has endorsed Laguna Niguel Mayor Linda Lindholm for Orange County Board of Education, Trustee Area 5. The party’s Central Committee voted unanimously to endorse Lindholm over the objections of the 32-year incumbent, who is a Republican. Mayor Lindholm, the leading candidate for the Orange County Board of Education’s Trustee Area 5 seat, is quickly setting herself apart as a consensus builder amongst education officials, organizations, taxpayers, parents, and teachers. A businesswoman, Mayor Lindholm has served as the President of the Saddleback College Foundation Board, as President of the Beta Foster Care Advisory Board, and as the City Liaison on the Laguna Niguel Youth Committee. She has also served on the Capistrano Unified School District Instructional Materials Review Committee and the Prevent Child Abuse – Orange County Advisory Board. Professionally, Lindholm has taught college students as a university instructor and worked with school districts on developing programs for teachers of children with physical and learning disabilities. She earned her Bachelor of Science Degree from Colorado State University and her Master’s Degree in Public Administration from the University of Kansas. Lindholm and her husband, Wayne, have three children. 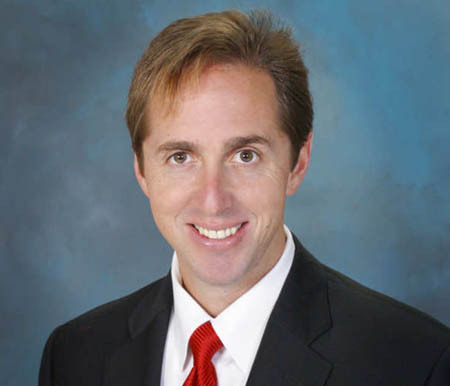 There are four announced Republican candidates in AD-73: Rancho Santa Margarita Councilman Jesse Petrilla, Dana Point Councilman Bill Brough, Capistrano Unified School District Trustee Anna Bryson, and former Laguna Niguel Councilman Paul Glaab. One Democrat, Attorney and Irvine Valley College Professor Wendy Gabriella, has announced for the race. Gabriella’s entry in the race virtually guarantees a Republican vs. Democrat general election, with the Republican winning handily and spareing South County Republicans an AD-73 general election intraparty bloodbath. Petrilla’s fundraising slowed in this reporting period ($15,824, second behind Bryson), but his dominant lead ($104,839) from 2013 maintained his position as the AD-73 candidate with the most money raised, with $120,663. He was the only candidate who raised more than he spent in this reporting period with his $15,228 in expenditures. This brings his total overall spending to just $23,410, and his tight-fisted spending has him actually fourth in expenditures. Consequently, he has nearly $100,000 cash-on-hand, once loans and unpaid bills are accounted for, with $97,577, to be exact. Republican Bryson, Republican Brough, and Democrat Gabriella have a combined $49,561 in that category (about half Petrilla’s figure), though adding the deeply-in-debt Republican Glaab leaves Petrilla’s opponents at a combined $14,550, which would mean Republican Petrilla has almost seven times the combined cash-on-hand of his opponents. It’s not unreasonable to leave Glaab out and note that Petrilla has twice the combined cash-on-hand of his non-indebted opponents. The biggest question is: why is Petrilla hoarding his money? I think the most logical conclusion is that Petrilla plans to dominate the AD-73 direct mail. Bryson raised more than her opponents this reporting period with $29,822, but she spent more than she took in, spending $32,514. She also has $14,279 in unpaid bills. Plus, she still lags behind Petrilla in overall funds raised. She spent half her money on her consultants. It’s not that her consultants are charging exorbitant rates – it’s simply that she has numerous consultants. She’s raised $114,965 overall but already spent $75,224; after accounting for that $14,279 in unpaid bills, Bryson is left with just $25,463 cash on hand, assuming she has no plans to spend her $69,600 loan. Her consulting fees are quickly eating up her once-sizeable warchest. Brough raised $10,297 this reporting period, bringing his total funds raised to $61,240. He spent $18,084 this reporting period, bringing his total spending to $39,744. He has a healthy mix of spending, with no one area jumping out to dominate his spending. He remains the candidate with the smallest loans, by far, at just $100. He, Petrilla, and Gabriella have no unpaid bills. 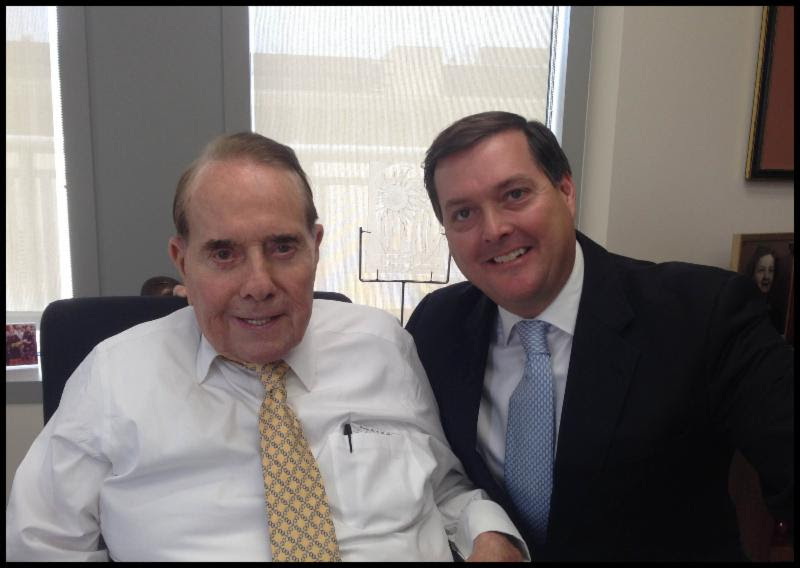 Among AD-73 candidates, Brough definitely has the most interesting campaign contributor, former U.S. Senate Majority Leader Bob Dole, who was the Republican nominee for President in 1996. The Brough campaign had announced the Dole endorsement two weeks ago, and Dole gave Brough’s campaign $500. Glaab raised $8,899 this reporting period, bringing his total funds raised from other people to $36,985. However, he also donated $22,000 to his campaign in 2013 (not loaned, but truly donated), bringing his total funds raised up to $58,985. He spent $40,053 this reporting period, bringing his total expenditures to $90,072, the highest level of expenditures of any candidate in AD-73. While Glaab has a mix of spending, he has spent a fortune on slate mailers. With the least raised and most spent among the Republican candidates (even after accounting for his self-contribution of $22,000), Glaab is deeply in debt, to the tune of $35,011. He’s clearly banking on the slate mailer strategy for this race, but he didn’t secure all the slates. On slates, in my January post, I said, “Glaab secured the vast majority of slate mailers. There are five major slate vendors, with Glaab grabbing three of them, including the two vendors who produce the most slate mailers. Bryson grabbed one vendor. It appears the fifth vendor is up for grabs still.” Well, Brough has since nabbed the fifth vendor. Slate mailers are now divided in this race, with three candidates nabbing the major slates, though Glaab has the lion’s share. Here at OC Political, we’ve railed repeatedly against the $100,000 paper tiger loans. (These loans of $100,000 or less are frequently used by candidates to artificially inflate their warchest numbers. While OC Political has many posts about those, this one is probably the seminal post on the issue.) I will give Paul Glaab credit for actually spending his own money. Glaab put his money where his mouth is, and donated $22,000 to his own campaign beyond the $100,000 loan he made to his campaign. State campaign finance regulations put that $22,000 forever out of Glaab’s reach; it is nonrefundable, and he must spend it on the campaign. Glaab was well aware of this regulation and properly reported the $22,000 as a contribution, not a loan. Democrat Wendy Gabriella raised $4,592 this reporting period, bringing her total funds raised to $16,703. She spent $9,507 this reporting period, bringing her total expenditures to $14,089. (Interestingly, top fundraiser Petrilla’s spending is so low that his expenditure levels are closer to dead-last fundraiser Gabriella’s than to any of his Republican opponents.) With no unpaid bills and a candidate loan of $1,196, Gabriella’s cash-on-hand is $2,614. Campaign finance reports for January 1-March 17, 2014 were due Monday. We will report more on this story along with the pending lawsuit to get Troy Edgar back on the ballot as soon as we get more information. Well, it’s that time of the election cycle again: campaign finance reports are out. OC Political will be doing our in-depth analysis to help you get past the campaigns’ spin on the numbers. First on the docket is the race for AD-74 to replace Allan Mansoor, who is leaving the Assembly to run for the 2nd District Supervisor’s seat, being vacated by the termed out John Moorlach. AD-74 consists of Costa Mesa, Laguna Beach, Laguna Woods, Newport Beach, the southern half of Huntington Beach, and portions of Irvine. The three Republican candidates in AD-74: Matthew Harper, Keith D. Curry, and Emanuel Patrascu. When OC Political analyzed the numbers for the end of the 2013 reporting, AD-74 was called the “Land of Small Warchests” in the post. Since then, Curry put his foot on the gas, and Patrascu stepped it up a bit, so those two are posting much stronger numbers (though still far behind races in other Assembly districts, but at the end of the day, to win this race, AD-74 only needs to worry about AD-74). The other three candidates’ warchests remain rather small, however. Before I start in on the numbers, it’s time to attack the $100,000 paper tiger loans. We’ve been attacking the fiction of the $100,000 loans for months on OC Political. (This July post is probably the seminal post on the issue, though it wasn’t until this August post that the paper tiger name was attached.) In essence, these $100,000 paper tiger loans are loans candidates make to artificially inflate their campaign finance numbers to impress donors and scare opponents. The reason $100,000 is the figure used is that’s the most a candidate can loan their own campaign and still get the money back. Any amount the candidate gives above $100,000 is forever donated to the campaign under state law. In AD-74, Republican Curry and Democrat Onofre gave their own campaigns $100,000 paper tiger loans. It also appears Republican Patrascu gave his campaign a smaller paper tiger loan of $29,700. Republican Harper has actually spent his negligible $4,100 loan. Curry had a slow start to 2013, but of course he declared his entry in the race just three weeks before Christmas. In the prior post on AD-74 warchests, I asked, ” If Curry can continue his pace of $21,200 per month, he will quickly amass the largest warchest in AD-74. However, many candidates find their fundraising slows down after an initial burst after their campaigns launch when they pick up their low-hanging fruit donors; can Curry defy the odds?” The answer is yes, he defied the odds. In this latest reporting period, Curry raised $32,871 per month. Curry added $83,768 this reporting period to his $21,200 from 2013, making him the first AD-74 candidate to break the $100,000 barrier in funds raised, with $104,968 in the course of his campaign. Curry transferred a negligible $6,490 from his city council campaign account in 2013, but transferred nothing this reporting period. He also gave himself one of those $100,000 paper tiger loans that we expect he won’t spend. Curry spent $32,271 on a healthy mix of items, including campaign literature, slate mailers, fundraising, ballot filing fees, and consultant fees. He has no unpaid bills. Even after subtracting out his loans, Curry still has $78,506 cash-on-hand. Patrascu added $25,679 in this reporting period to his $35,395 haul from 2013, bringing his total contributions to $60,974. He made no transfers. He has $29,700 in loans. He was incredibly tight-fisted with his expenditures, spending only $5,098, all of went to fundraising expenses, campaign treasurer expenses, and ballot filing fees. He has no unpaid bills. After subtracting out his loans, Patrascu still has $54,021 cash-on-hand. Harper only raised $2,150 in this reporting period ($1,900 from Rainbow Disposal and $250 from attorney Dave Bartels), adding to the $4,100 he raised in 2013 from Karen Harper last year, leaving Harper with $6,250 raised. He transferred in $11,150 from his City Council account into his Assembly account, all during this reporting period. He loaned himself $4,100. He spent $15,674, with $13,700 going to Jim Lacy’s Landslide Communications slates, $1,906 going to his treasurer Dave Bauer for either campaign literature or treasurer fees, and $68 in small unitemized expenditures. He has $17,763 in unpaid bills, with $13,700 on his credit card to pay for Lacy’s Landslide slates, $4,028 on his credit card to pay ballot filing fees, another $1,927 in small unitemized unpaid bills, and $35 on his credit card to pay for small office expenses. After subtracting out the loans and accounting for his unpaid bills, Harper is $19,940 in debt. The Democrats are easy to summarize. Ali has not yet hit the $25,000 mark to require online campaign finance filing. Onofre gave herself a $100,000 paper tiger loan. She spent nothing and transferred nothing. 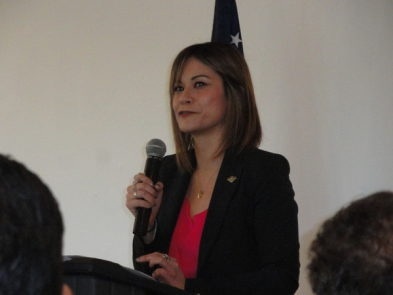 She has a single $100 contribution from Republican CD-45 candidate Greg Raths; from the date of the contribution, Onofre was still a Republican at the time. I imagine Raths will be asking for his $100 back since Onofre has become a Democrat.